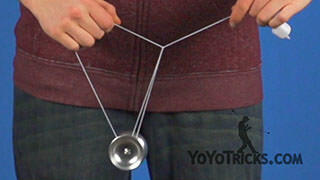 Learn how to do the Gravity Whip Yoyo Trick. 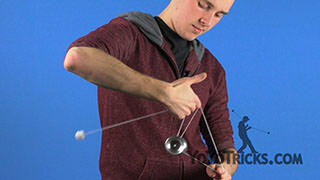 Gravity Whip is actually a 5A variation on the 1A yoyo trick, called Plastic Whip. So if you have not mastered Plastic Whip, you are definitely going to want to check out our tutorial for that. 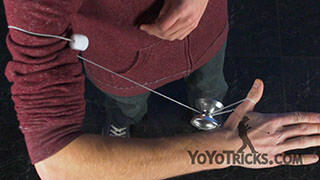 To start Gravity Whip, first we are going to throw a breakaway and just let the yoyo sleep at the end of the string. 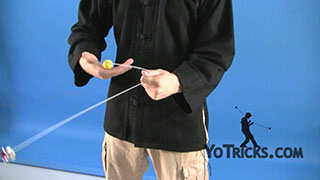 Then we need to set up our hand properly for the whip motion. To do that, I am going to make a gun shape with my pointer finger and my thumb. 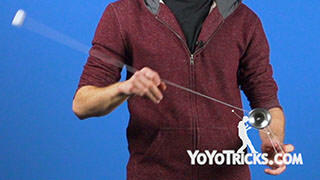 You will see that the string leading up from the yoyo is actually coming over my middle finger, not my pointer finger. 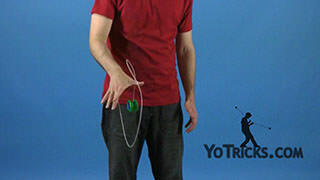 So I am going to take this gun shape, and I am going to wrap it underneath the string so that the string leading up from the yoyo is coming over my thumb all the way across to my pointer finger, and then between my pointer finger and my middle finger. From there, we are basically going to perform a plastic whip. 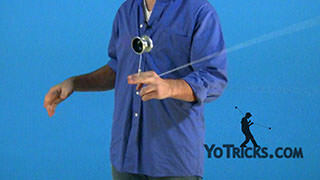 We are going to pop the yoyo up, and make the slack motion that forms a Plastic Whip. With regular plastic whip, what you do is you pop the yoyo up, you bring the slack around the yoyo, then the yoyo falls into the slack, bringing it all the way down. We are going to do something a little bit different with Gravity Whip. 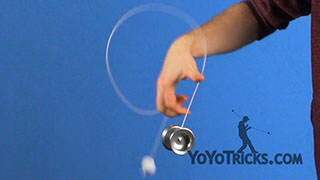 Instead of letting the yoyo fall, we are actually going to start the whip motion right when the yoyo reaches its apex. You want to get this as close to your hand as possible. 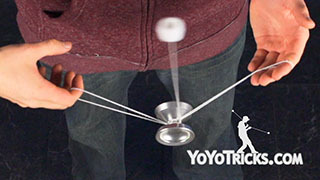 Right when the yoyo reaches the top, you want to loosen your grip on the counterweight, which is going to pull the slack around the yoyo. You will see that the counterweight shoots out from the back of my hand. 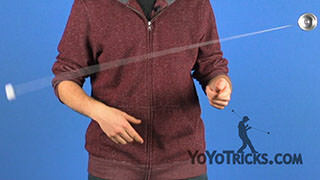 When you are doing this motion, it is really important to make sure that the up and down motion is perfectly straight up and down, because otherwise the counterweight is going to come out at a weird angle and it might hit the yoyo. 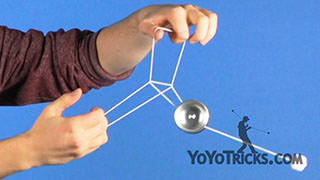 To go over that again, pop the yoyo up as soon as it reaches the apex close to my hand. 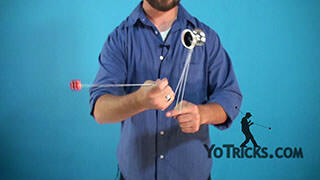 I am going to let the counterweight go and the slack is going to close around the yoyo. 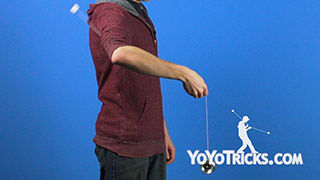 From there I am just going to swing the yoyo forward, drop this loop off my thumb, loosen my grip on the counterweight, let the counterweight slide into my hand, and land the yoyo onto a trapeze. From there, you can perform a bind. 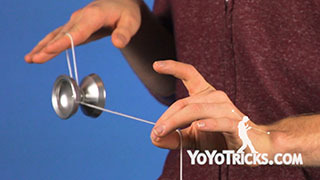 If you are looking for a more challenging way to make this trick more visually appealing, rather than doing the whip with the yoyo hanging at the end of the string, instead we can swing the yoyo up so that the yoyo string is parallel with the floor. 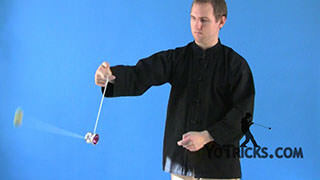 Then we can pull the yoyo back and perform the whip motion. Because the yoyo has a lot more momentum in this direction with this variation, we want to bring our hand back to stall the counterweight. 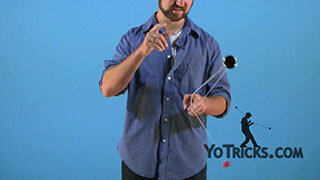 Then we can swing the yoyo back forward to dismount from the trick. 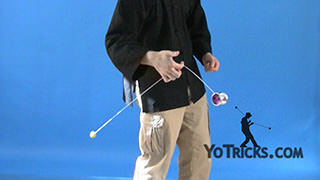 Because this variation requires a lot more precision and speed, it can actually be really beneficial to do a couple of pinwheels before you let go of the string, just to keep everything in line, and to make the whip much easier to perform. 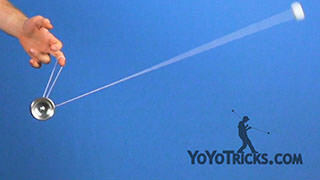 If you are having some difficulty with this trick, we have some tips for you. 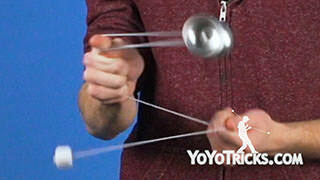 The first is to make sure that you are not chucking the counterweight down after you bring the yoyo up. That makes you lose control of the counterweight and because our hand already has a lot of downwards momentum, all that we want to do is gently let go of the counterweight, and that will give the counterweight enough energy. 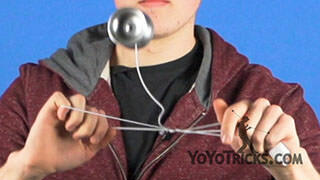 The second tip is that you might find yourself missing the yoyo with the slack. 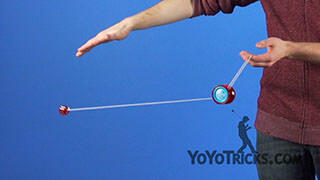 When that happens, you just want to make sure that your hand is perfectly in line with the yoyo. 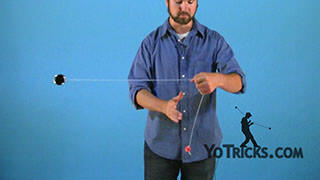 You will see that this string between my thumb and pointer finger is right in line with the gap, so that when I pop it up, the string comes in line with the yoyo and the string goes around the yoyo. 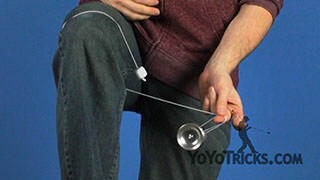 Finally, if you are having a hard time dismounting from the trick, just make sure that you turn the back of your hand out a little bit so that the counterweight can swing to the front of the yoyo. 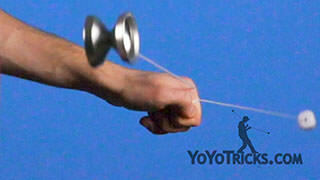 And that is the Gravity Whip.